Enjoy this original folk song that explores themes of sacrifice, love and loss. A sweet revisionist twist on the story of Noah's Arc that explains how the unicorns became extinct. “For we have a plan. Till we reach the other side”. Special Thanks to Team Isis (Sanam Erfani, Kyle Rostan, Athena Zhe, Katarina Lott, Cyle Jackson, Michael J Clark, Kevin Kolack) for the making of the music video. 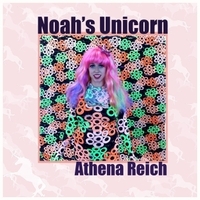 Please check out the official music video of "Noah's Unicorn" on YouTube. Unicorns at the end of every rainbow! I love this song. Google the video, a joyous delight. And check out Athena as Gaga. She's outrageous! !